A woman walks around collapsed homes in Sigi regency, in the aftermath of deadly earthquakes and a tsunami that battered Indonesia’s Sulawesi island, Oct. 7, 2018. An estimated 5,000 people were believed to be missing in two villages where homes were swallowed by a devastating earthquake in Indonesia’s Sulawesi island, national disaster officials announced Sunday as they dramatically revised the number of victims unaccounted for nine days later. At least 1,763 people were killed in twin temblors and a tsunami that struck the area on Sept. 28, said the National Disaster Management Agency, which was working to verify reports that some 5,000 residents of Balaroa and Petobo – villages located on the outskirts of Palu, in Central Sulawesi province – were still missing in the disaster’s wake. “The 5,000 figure is based on information from village chiefs. Exactly how many, we don’t know,” agency spokesman Sutopo Purwo Nugroho told a news conference in Jakarta. “It has to be verified. It could be that they have sought refuge elsewhere,” he added. The two villages were obliterated by the disaster, with witnesses reporting that houses were swallowed by mud and dislodged by hundreds of meters. The National Search and Rescue Agency, a different agency, had estimated earlier that more than 1,000 people were missing in Petobo alone, after the soil there turned to liquid during one of the earthquakes through a phenomenon known to geologists as soil liquefaction. Sutopo said the government had set Oct. 11 – this coming Thursday – as a deadline for completing post-disaster search operations. However, Wiranto, Indonesia’s security minister, said the government was considering ending search-and-recovery operations in the Petobo and Balaroa areas by declaring them as mass graves and leaving them untouched. “We have to make a decision as to when the search for the dead will end. Then, we later must decide when the area will be designated a mass grave,” Agence France-Presse quoted him as telling reporters late on Friday, adding that government officials had been discussing the possibility with local leaders and clergy. On Sunday, Muhammad Syaugi, the chief of the National Search and Rescue Agency indicated that hopes were fading for finding more survivors. “This is day ten. It would be a miracle to actually find someone still alive,” he told AFP. Meanwhile, a semblance of normalcy returned to Palu on Sunday, as shops and gas stations reopened and electricity was restored to much of the capital of Central Sulawesi. Matahari, a major national retail chain, was offering a 50 percent discount on products as it opened its doors to customers. Shop attendants wore bright red shirts and welcomed visitors with big smiles. “Our facilities were badly damaged but we have been trying to reopen our businesses to speed up Palu’s recovery,” said James Riyadi, chief executive of the Lippo Group, which operates Matahari, the Siloam Hospital and other businesses in the area. Several traditional markets, grocery shops and mom-and-pop stalls had also reopened. Shops selling mobile phones and construction materials were attracting buyers as survivors of the disaster started to rebuild their lives. “It seems that the economy is running again in Palu because the shops are open,” Dika Winata, a South Palu resident, told BenarNews. Tauhid Wijaya, another local, said some shops were selling goods at higher than usual prices. A shop owner in South Palu, Jaka Marten, said he had reopened his business two days ago. “Business has been brisk. Customers just keep coming,” he said. Motorists were also flocking to gas stations in parts of the city. “Thank God there are no long queues. We fill up as soon as we come,” said Muhammad Sigit, 26. “Fuel isn’t rationed anymore so we can buy as much as we want,” he said. The state-run electricity company, PT PLN, said all seven of its substations in Palu, Sigi and Donggala regencies, which were damaged in the disaster, had been repaired. “Right now we are focusing on fixing all power infrastructure in Donggala, but it will be gradual because access is still difficult,” said Syamsul Huda, PLN’s business director for Sulawesi. 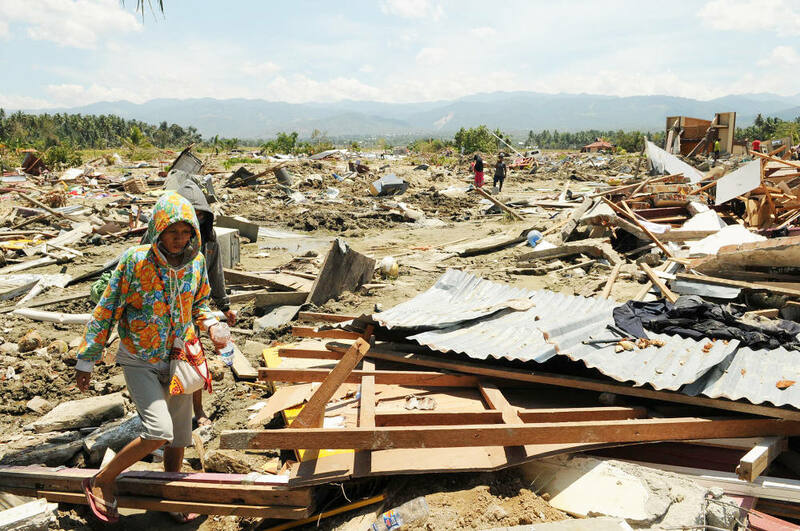 East Palu resident Adriansyah, 29, who had been forced to live in a temporary shelter after the disaster, said that he and his family had moved back into their home after the power was restored. “There have been two outages today, maybe they are still fixing things,” he told BenarNews. Meanwhile, foreign aid was pouring into disaster-stricken zones of Sulawesi. At least 10 countries – including the United States, Australia, Malaysia, Singapore, Britain, France and Germany – have sent search-and-rescue teams or provided military cargo planes to assist Indonesia in the recovery efforts. On Friday, the American government announced an additional $3.6 million in humanitarian assistance to Indonesia to help people affected by the disaster. The funding brought the total American aid package to $3.7 million, USAID spokesperson Clayton McCleskey said. The U.S. Agency for International Development was airlifting 2,210 rolls of heavy-duty plastic sheeting from its emergency warehouses in Dubai and Malaysia, enough to provide 110,500 people with temporary shelter, McCleskey said. A team of disaster experts from USAID was also in Indonesia to assess damage and work with local authorities and humanitarian organizations, he said. 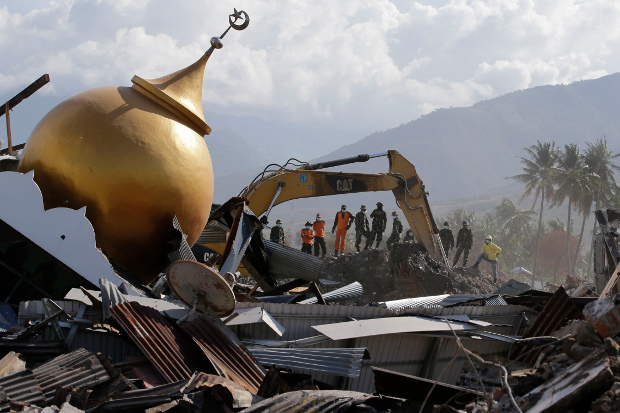 The latest natural disaster to hit Indonesia occurred almost two months after a series of powerful temblors devastated Lombok island, killing at least 555 people. Indonesia straddles the so-called Ring of Fire, an area in the Pacific Ocean basin known for seismic upheavals and volcanic eruptions. On Dec. 26, 2004, about 130,000 people died in Indonesia’s westernmost province of Aceh when a magnitude-9.1 earthquake struck off the west coast of Sumatra, unleashing a series of devastating tsunamis. As a result, at least 230,000 people were killed in a dozen Asian countries.